I mentioned it in my article about the Timex Andros, I hinted at my love of it in my initial impressions, Blake put it alongside a Rolex Submariner and now I want to get down to it; the Seiko 5 SNZH is sort of a perfect watch. It is well made, it is nicely detailed, it has an automatic movement, it looks fantastic, it is versatile, it is unique and it is very affordable. The review is over; go buy one… But seriously, save a couple of overlookable faults, the SNZH53 is exactly what I wanted it to be. I bought the Seiko 5 SNZH53 because I had been pining over various heritage divers I could not afford or track down, like the Helson Skin Diver. I eventually caught wind of the SNZH while I was looking for an affordable alternative to these watches, and I stumbled upon a forum post regarding the Seiko “Fifty Five Fathoms” mod. For those unaware of what that means, this DIY modification, which consists of installing an aftermarket face on the watch, is based on the famous and to-die-for Blancpain Fifty Fathoms. 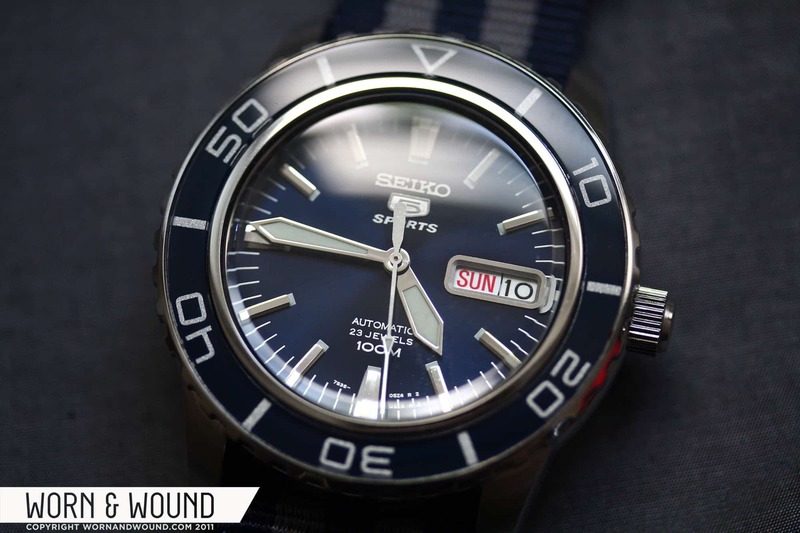 The Seiko 5 has some distinct physical characteristics in common with the Blancpain, while not being a knockoff, which lends this mod a unique look that makes it very popular. Also, it will run you about $10,000 less to make or buy a “modded” version. But, I wasn’t looking for a DIY project (though that might be fun further down the road); I just wanted a nice heritage diver. So I looked into the SNZH line. The “Fifty Five Fathoms” mod is most often made with the 57 version, which is black with gold details. I think the 57 is gorgeous and probably best exemplifies the vintage feel that drew me to the genre, but for wear-ability’s sake, I was not looking for something with gold. So when I saw the 53, with its blue and silver décor, I knew I had found the model for me. For $165, there really was no debate. I already knew that Seiko 5’s are great watches, given my experience with the SNK803k2, and after the digging I had done I knew this was the most affordable option for me. Regardless, an automatic with day/date and hardlex mineral crystal for $165 is always going to sound good, such is the magic of the Seiko 5. As I discussed in my initial impressions, the look, feel and construction of this watch does not let down. The 42mm x 14mm stainless steel body is heavy and solid. It is polished around the sides of the watch and lightly brushed over the top of the lugs, which is a nice touch that breaks up the sheen of the steel. The sculptural sweeps of the lugs and slight bulging radius of the sides of the body closely resemble that of the Blancpain’s. In this detail, I have to say, the SNZH out shines some its more expensive brethren that have straight sides. The added curves create a certain elegance that aid in the versatility of this watch, letting it transition from a nice sporty diver to a tasteful dress watch. The 120-click unidirectional bezel is nicely proportioned to the watch, though it does not appear to be as wide or rotund as that of the Fifty Fathoms. It turns with a satisfying click and has substantial resistance, that is to say you wont accidentally turn it. The bezel is inlayed with a deep blue acrylic insert that has markings in a silvery grey. The markings are slightly unusual in that they mark every 10 with a numeral rather than every quarter, which is more typical of the style. This is actually one of the differences that, in my eyes, really distinguishes the SNZH as a unique watch rather than a copy. The font they used is also very interesting and different in that it is much more elongated and geometric than usual. The edge of the bezel is polished steel with 60 little square teeth for grips that are both purposeful and decorative. Given that divers are so often defined aesthetically by the style and size of the bezel, it is an important feature to be well detailed and in this instance I believe that Seiko did an excellent job. Often I find bezels to be tacky and over done, which might actually be what draws me to the heritage divers in the first place; their bezels are always minimal. The face of SNZH is simple, easy to read and quite nice to look at. The face itself is a metallic blue “sunburst” that shines radially from the center out. There are 60 markers around the edge, which supplement the markings on the bezel. At every quarter hour, except 15 where there is a the day/date window, there is a large beveled metal insert with a slightly tapered shape and at every five minutes there is a smaller beveled metal insert. The three dimensionality and polished look of the inserts is very attractive and gives the face a surprising amount of adornment, as though these were small steel diamonds. There are also thin white lines marking the rest of the minutes. On the inner edge of all of the metal inserts is a small rectangle of lume that aligns with the tip of the hour hand. When the lume is charged this ring of rectangles looks very cool. Unfortunately the lume is very weak, so you wont see it without manually charging it with a light source. This is probably the biggest draw back of the watch, to be honest. I love it when lume gives a face a second personality in the dark, and I believe this design would have done that, but in the end, at night you only see the hour and minute hands, which are large roman swords with lume filling. The seconds hand is a thin polished steel rectangle with a lume filled triangle about halfway from the center to the long edge. The large day date window is the same as it is on all Seiko 5s. Though I appreciate the added functionality and value of having a day/date, I find it to be a bit visually disruptive in this circumstance. Nitpicking aside, I love the face of this watch. I think Seiko took a unique approach to capturing a vintage aesthetic without coming too close to any existing or famous designs. The crystal of the SNZH is a domed hardlex mineral that measures 28.9mm in diameter. The dome of the crystal, which is really a welcome addition to any watch, bevels down sharply before reaching the bezel edge. Though I have only examined photos, I believe the shape is very similar to that of the Fifty Fathoms. The back of the watch displays the 23-jewel 7S36B automatic movement, which though undecorated is still quite nice to look at. So far, I have noticed no accuracy issues with the movement, as is to be expected from a Seiko. Why the SNZH has a 23-jewel movement and the SNK803k2 has only a 19 is unknown, but visually they are very similar. I have not noticed the rotor noise, as I did with the SNK, on this model. Whether this is due to it being a different movement or the bulk of the watch, I do not know, though a suspect it is the bulk. As I mentioned before, the metal bracelet that comes on the watch leaves something to be desired. It is generic, tinny and does nothing for the look of the watch. Hey Seiko, ship these with a nice blue ZULU strap and save everyone some money, thanks. Anyway, picking up a nice strap for the 22mm lugs is easy enough to do, and so far I have loved the way it looks with different straps. The first one I put on it was a blue and grey NATO purchased from Gnomon. The stripes increase the sportiness of the watch and complement the blue and silver palette. I’d call this my casual option for the watch. To increase wear-ability I also got a straight deep blue ZULU from Holben’s, for times when the stripes of the NATO might clash with the pattern on my shirt: once again, a successful combination. My favorite way to wear it, however, is with a Hirsch “Natural Line” Golden Brown strap. The luscious brown leather mixed with the polished steel and blue face is just a true winner that looks great with about any clothing combination you can throw at it…I mean, brown and blue just sing when they are next to each other. I know I griped a little bit about the lume, date and bracelet, but rest assured, this is one of my favorite watches. So much so, that I am genuinely considering getting a SNZH57 and modding it and also getting the all black SNZH59 model, since it is just gorgeous. One other thing to note…Though I have been casually referring to this watch as a diver throughout the review, I wouldn’t actually go near water with it. Personally, the deepest I dive is when I accidently step in a puddle, so this is of no consequence to me, but if you are looking for that function, this isn’t the watch for you. It is rated to 100m, which sounds terrifyingly deep to me, but considering it does not have a screw down crown, I would not be inclined to test that. Moral of the story, if you want a way into the heritage diver scene without breaking the bank, are looking for a stylish automatic with good build quality and vintage looks or just want another Seiko to rotate in, I think the SNZH line is a great way to go. BTW, if you are looking for a Fifty Five Fathoms mod, but are not inclined to take apart a watch, they do show up pre-assembled on the forums here and there…this one was sold, but you can get the picture. Just search seiko FFF and see what you find. Not bad at all, and nice pics! Now I want one with a blue face and gold details. Definitely a stunner on the leather strap. Great review. You might have sold me on getting one for my next watch. Great article! Seiko should pay you for writing an enormously compelling advertorial. I just don’t understand how they can sell a superb piece like this for a paltry $165. The slight lume problem doesn’t fase me a bit, but I agree with what you said about the date. They should have toned it down and omitted the day. Seriously, who needs a watch to tell them what day it is? Anyone who doesn’t know what day it is wouldn’t be smart enough to buy this watch in the first place! This is a Seiko 5. The day cannot just be taken out from it. 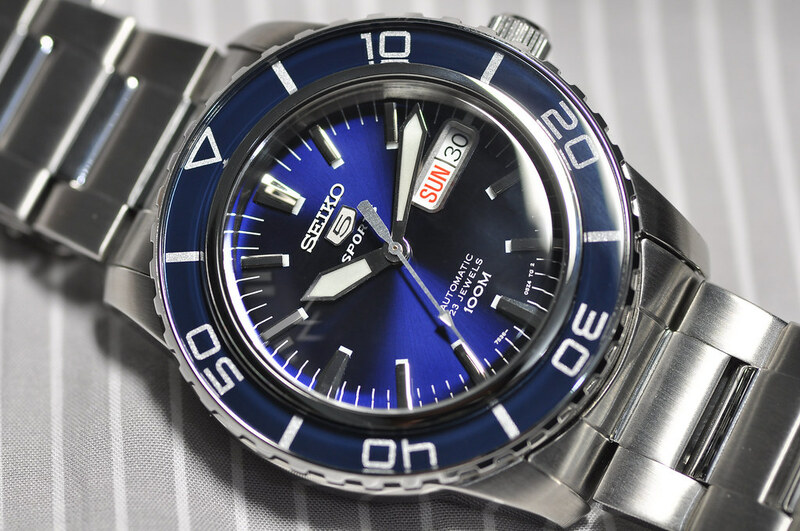 Seiko certainly has other divers that display the date only, but the % emblem demands that there would be a date indicator. Plus, i got so much used with this that i would have a hard time choosing a second watch that doesn’t display the day, even though i’m smart enough to know it without looking at the dial. I love the Seiko/Hirsch combo. Unfortunately I can’t find that strap in 22mm anywhere! The link in the article goes to Holben’s where only 18 and 24mm are available. Sorry to hear that, they must have sold out of them. I’ll keep an eye out for another source and link it in the article if i find one. Thanks for letting me know. This is a great review, Zach! And some fantastic pics, too. Thanks so much. I’ve been thinking long and hard about my next watch. I’m really into divers watches, vintage divers especially. But the truth is those old watches have given me a lot of trouble. They’re hardly ever waterproof anymore and more often than not in need of some serious maintenance and repair. And this will easily triple the price you paid for them in the first place. So, I’m really looking for a new watch with vintage looks. And then there’s the price issue, of course. I mean, I would just buy a Black Bay Heritage or a Superocean Héritage if money weren’t an issue. But then, where’s the fun in just buying the first expensive watch you find, that looks nice. ; ) The endless searching of the internet and the months of window shopping makes half the fun of buying a new watch, imho. Long story short, I’ve really fallen in love with the looks of the SNZH53. I especially love how it looks on that blue striped zulu band. And with what I hear about the quality of Seiko watches, plus it’s price, I’m sure this is the perfect next watch for me! Got this watch and it is amazing quality. Also got the golden brown strap to go with. Lovin’ it! Just ordered one, along with the stripped band and leather band. Can’t wait for it to get here. Thanks for pointing me in this direction. Was looking at that J.Crew Andros but this is so much nicer. Thanks for the review! Question on the strap size. You mention in the article that the strap is 22mm, but the amazon description lists the band width is 20mm. When buying aftermarket straps, what do I go by? Cheers! Nice review. I bought the watch a couple of hours are reading this review. What a beautiful watch! Great article. You convinced me. I picked one up after reading your review. One question – how do you wind the watch if it has been sitting for a few days? Is there no winding spring from the crown? As you noted, there is no screw down crown and when I pull the crown out and twist, the day and date change. It’s an automatic, so just wave it back and forth a bit to get the rotor spinning, which will in turn wind the movement. Once the watch is functioning, set the time and date and put it on. Your body movement will keep it wound from there on. Got it. Now I understand the distinction between automatic and self wind. Thank you. Great website. You were right about the bracelet being tinny and cheap feeling. The brown leather strap looks great with the blue. Ordered one based on this review. Any recommendations for a 20mm lug seiko diver?? Blue and brown works like a charm, and only 165?! Just wow! I recently bought a leather nato-esque strap (http://formfunctionform.com/product/button-stud-watchband-adjustable-cordovan/) that has turned out to be slightly too thick for the watch I intended it to go on. how do you think something like that would fit with the spring bar/case clearance? Neat article and great site. Fascinated by the article and photo of snzh53k1 I searched for it with local ADs. Visited four and only one had it. Last piece. No bargain. Spent the equivalent of $250.Incidently I am from India. Everything you wrote is absolutely true. But I find the bracelet okay. I will enjoy wearing this diver for a long time and hope this will be a hot vintage in the future. Thanks. What size strap does it fit? I see 18mm up to 24mm? Hi. I’m loving this watch and great review.. I ordered one but am struggling to find the band’s. Can you repost the links? thank you for the detailed pictures and the review..
definitely a watch to keep in consideration for the next purchase. Can anyone recommend an alternative stainless steel bracelet? The brown leather strap is fabulous! Can you paste a link to it? Thanks in advance!